Since the early dates of the Force, a tradition of photographing the “Depot” Troop members has continued to this day. The following is a 1902 troop photograph of North West Mounted Police recruits. As noted in the photograph, the wearing of a mustache seemed to be common practice. 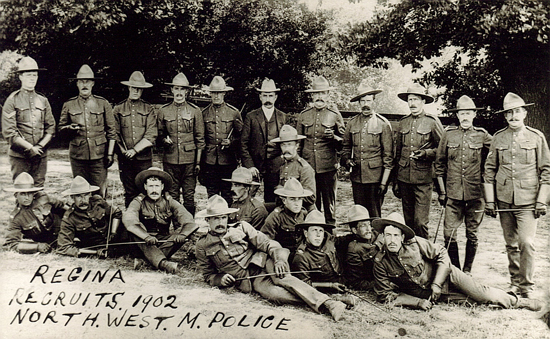 1902 – Troop photograph of North West Mounted Police members at “Depot” Division (Source of photo – Ric Hall’s Photo Collection). With the introduction of the automobile to the Force, new recruits had to be taught the fundamentals of maintaining a police vehicle. To key factors were: where to but the gasoline and CHECK THE OIL LEVELS REGULARLY. Failing to do so would result in the repair costs coming from the member’s salary. 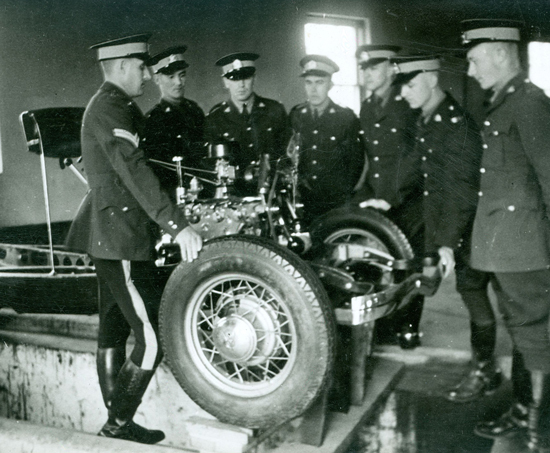 Photograph of RCMP “Depot” recruits being taught about the fundamentals of police vehicle maintenance. 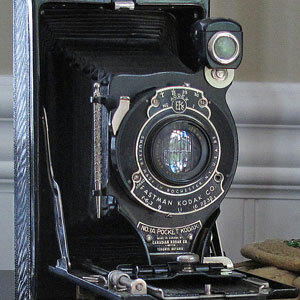 (Source of photo – Ric Hall’s Photo Collection). Dismounted Cavalry Drill has been used to teach members to work as a cohesive team and to follow instructions. For a period of time, rifle drill was a component of basic training. 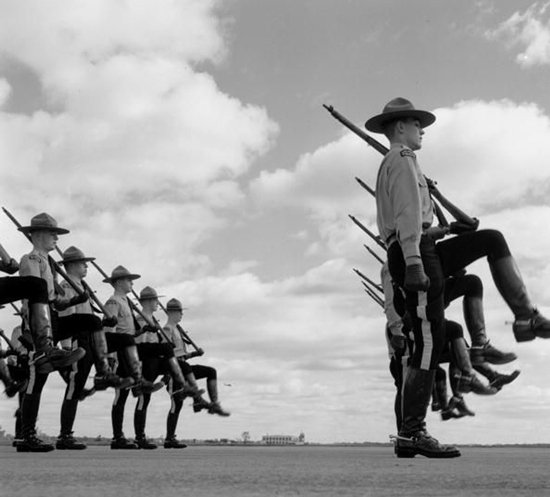 1950s Photograph of RCMP Recruits performing the command of ‘marking time with a Lee-Enfield 303 rifle (Source of photo – Ric Hall’s Photo Collection). 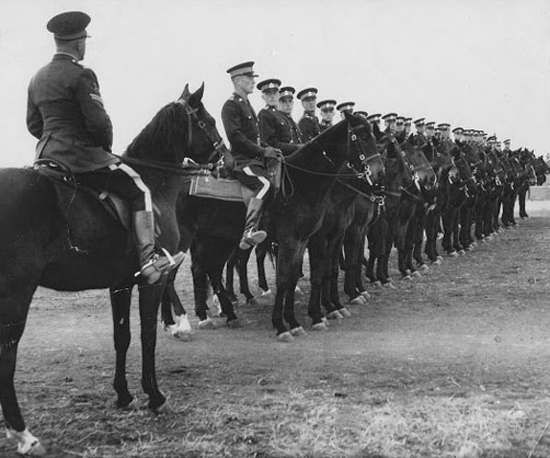 Since the establishment of “Depot” Division, equestrian training was a key component of recruit training but was discontinued in the late 1960s. 1950s Photograph of “Depot” Equestrian Training for new recruits (Source of photo – Ric Hall’s Photo Collection). One of the other primary courses of instruction was firearms training. 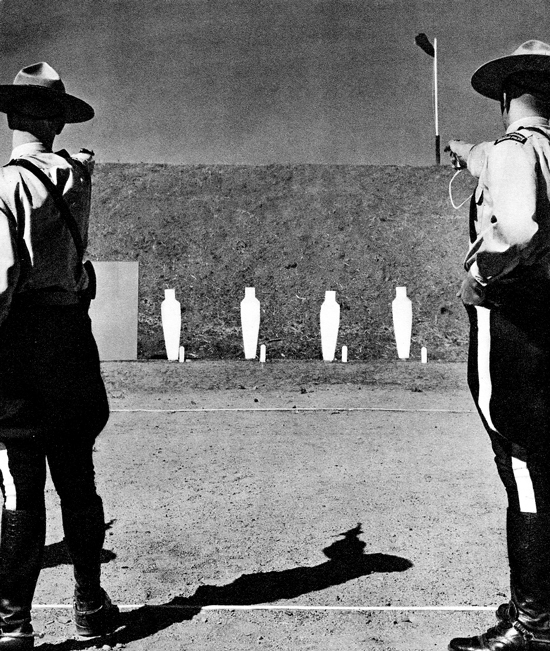 Originally, the firearms training was done at “Depot” on the outdoor range. Once the recruits graduated from “Depot”, they would participate in the annual firearms qualifications at similar outdoor ranges across Canada. 1950s – Photograph of the “Depot” outdoor range (Source of photo – Ric Hall’s Photo Collection). If you have Force photographs that you would like to have included in a forthcoming Photo Corner, please contact Ric by email him at rshall69@shaw.ca.